CAUTION OPEN DOOR SLOWLY SAFETY SIGN BRAND NEW BRADY 22516 LARGE 14" x 10"
CAUTION OPEN DOOR SLOWLY. Study Photos. LARGE BRILLIANT 14" x 10". THESE SIGNS ARE GREAT FOR DOORS THAT HAVE NO WINDOW. EYE PROTECTION REQUIRED SAFETY SIGN BRAND NEW BRADY 22400 CAUTION 14" x 10"
EYE PROTECTION REQUIRED SAFETY SIGN. LARGE BRILLIANT 14" x 10". White letters on black background for perfect visibility. Includes international symbol. Each corner is rounded for longer life and easier handling. Weather resist plastic material. Features a sleek rounded corner design. Plastic Sign Rectangle "Utility Room"
Glow-In-The-Dark Projection EXIT Sign. Projection styles allow for greater visibility from more angles. 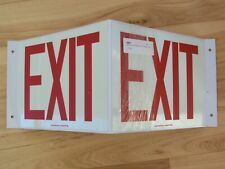 Ensure exits are clearly marked and that the exit sign can be seen from either direction. 3D Signs project at 45 degree angle providing viewing from the front and sides. Red letters on a White background for perfect visibility. Each corner is rounded for longer life and easier handling. Weather-resist plastic material. Clearly, states where the fire extinguisher is located. Item Caution Sign. Header Caution. Sign Material Aluminum. Legend Hot. Sign Background Color Yellow. Header Legend Color Yellow. Sign Legend Color Black. For indoor and outdoor use, this abrasion- and chemical-resistant sign puts important information right where you want it. Haws New Eye Wash Station Plastic Safety Sign 8 x 10-3/4 in. New Haws Eye Wash Station Plastic Safety Sign. Colors: Green and White. Mounting Tape Included. Listed As Used, Never Opened. 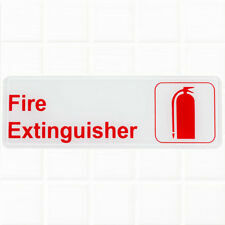 Signs made of flexible plastic for added durability. Includes mounting adhesive pads. You are buying just one sign ,,,,. 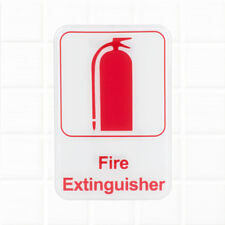 Plastic Sign Rectangle "Cellphone Charging Area"
FIRE EXTINGUISHER SIGN. SAFETY SIGNAGE. FOR HANGING ON WALL OR DOOR. RED WITH WHITE DESIGN. EMBOSSED DESIGN. Red letters on a White background for perfect visibility. Each corner is rounded for longer life and easier handling. Weather-resist plastic material. Features a sleek rounded corner design. Red and White contrast that ensures optimal visibility. Plastic Sign Rectangle "Changing Room"
Plastic Sign Rectangle "Restroom with Shower"
Item Restroom Sign. Legend Style Symbol. Sign Subject Matter Restrooms. Sign Background Color White. Sign Mounting Style With Mounting Holes. Sign Legend Color Black. Never used. Front of sign has a few marks. MATERIAL SAFETY DATA SHEET Binder W/CHAIN 10-1/2 In. W 1-1/2 In. D BRADY 2023. This standard Material Safety Data Sheet (MSDS) binder features a durable polyethylene cover, 36" chain, and a pair of sheet lifters. OSHA Notice Safety Sign: Hard Hats and Safety Glasses Required Beyond This Point. 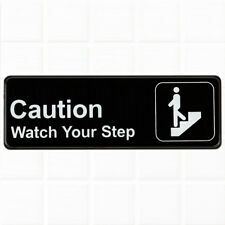 Ensure workers understand that PPE is mandatory by placing this sign near work area. Chemical Resistance: Excellent. Corrosion Resistance: Excellent. Nudell Clear Plastic Sign Holder Wall Mount 8 1/2 x 11 38011Z - Sold as 1 EA. Protects and clearly displays insert. Protects insert and clearly displays. Product Number 88617. Text Legend RESPIRATOR REQUIRED. Illumination Not Illuminated. Reverse Legend No Reverse Text. Reverse Header No Reverse Header. B-302 is an indoor/outdoor high performance pressure sensitive safety sign, and is surface printed polyester with a polyester overlaminate. FLUORESCENT YELLOWBOLD LETTERING WITH LARGE 4 1/4" tall x 13" wide BLANK AREA FOR ADHESIVE LETTERS OR A BOLD SHARPIE MARKER. THE BIG BOLD FONT HERE IS HARD TO MISS. MADE IN THE USA, WEATHERPROOF AND UV RESISTANT. Chicago Lighthouse "Think Safety" Wall Clock. Use in the office, warehouse anywhere at work as a reminder to work safely. Identity Group Customizable Door and Wall Sign 2X10 10807 - SOLD AS 1 EA. May be permanently attached to walls. New inserts can be easily created and changed out as needed. • Easily customize your own wall sign. Play it safe when transporting petroleum crude oil with Labelmaster's UN 1267 Flammable Liquid Placards. Nudell Clear Plastic Sign Holder Wall Mount 8 1/2 x 11 38008Z - Sold as 1 EA. Protects and clearly displays insert. Protects insert and clearly displays. FACTORY FRESH. GREAT ART DECO LOOK! 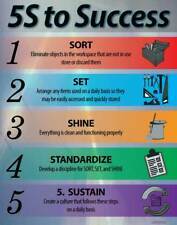 5S to Success Lean Poster, 22" X 28"
NOTICE Truck Drivers Shut Off Motor Set Brakes Set Wheel Chocks Sign 10" x 14"